My #1 book recommendation when it comes to thought leadership. Tags: Thought leadership, marketing, sales, selling, teaching, spreading the word, changing the world. You have a message to share, but you’re not sure where to start. You are an expert in your field, and now you’re ready to be recognized as an expert in your field. You want to write a book, and you want to know how to build a following to help you market it. Great, practical book on how to promote your business. I just relaunched my personal blog and am going to do an experiment and try all his suggestions to see what happens. I had just barely started writing for Forbes. I had a few hundred followers on Twitter. I had perhaps 20 or so followers on my Facebook page. Nobody knew who I was outside of family, friends, and close business associates, i.e. I had very little influence beyond my immediate connections. 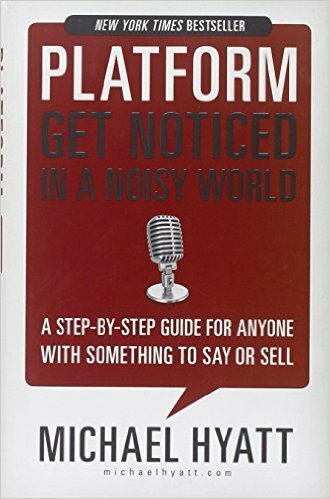 I wasn’t looking for Platform when I read it. That is, I wasn’t trying to become a thought leader. I didn’t even know what a thought leader was. I can’t remember why I read it, but once I read it I realized that my 13 or so years (at the time) as an entrepreneur running a digital marketing agency and having worked with hundreds of clients meant I had knowledge and information others wanted, and I wasn’t doing anything to share it. I also saw the potential in building my own platform to grow my business, increase influence with others, and help others maximize their potential. I have no written upwards of 200 articles for Forbes, Entrepreneur, Mashable, TechCrunch, Venture Beat, Fast Company, Time, the South China Morning Post, TechinAsia, and a host of other publications and high traffic blogs. I have well over 6,000 followers on Twitter and it’s growing by 100-200 per month. I have almost 600 followers on my Facebook page (yeah, that’s not great, but I haven’t focused on it, either). I got a book deal with an established business book publisher. I now have people paying me to teach them how to be thought leaders. My business has grown by over 1,000%. I’ve had the opportunity to speak at events, sometimes getting paid for it, in Hong Kong, Singapore, Dubai, Taiwan, and in multiple places in the U.S. Most of all, I’ve been able to have the satisfaction of helping people grow great companies, and I’m having a blast doing it! Would any of this have happened without Platform? Perhaps. But I have no doubt I progressed much, much faster because of what Hyatt’s book taught me. If you’re looking to do what I’ve done, start with this book.